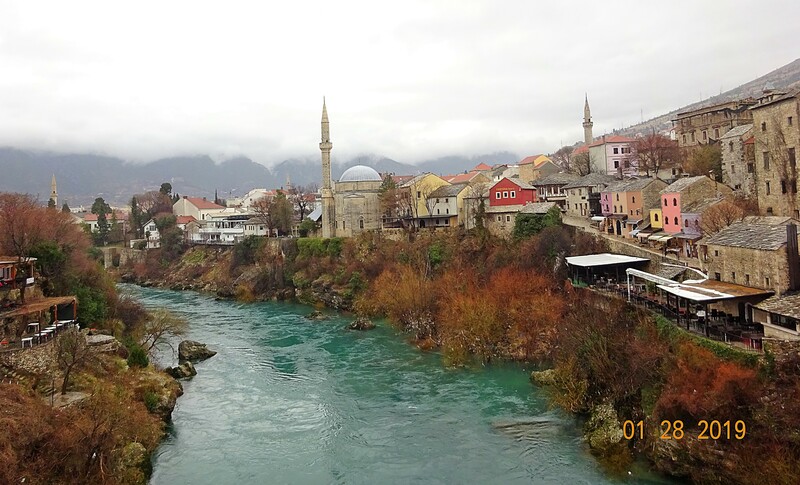 The day tour to Bosnia was interesting, and since my time in Dubrovnik is over soon, I decided to go rain or shine. Unfortunately, the weather was terrible putting a damper on photos and exploring. 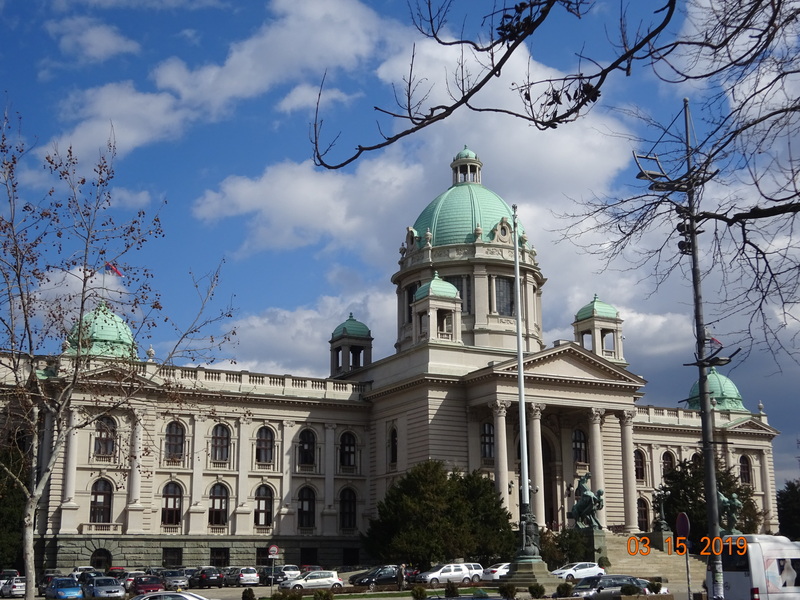 Our guide shared history and entertained us with folktales and side stories about his life in Bosnia and Croatia. There were two others in the group, a couple who had sailed to Dubrovnik. Their sailboat was undergoing maintenance. Sadly, they were the worst tour companions imaginable. Details are inappropriate for a blog but included mean and nasty fights followed by making up – insane, disturbing behavior. The uncomfortable scenes could have been from Edward Albee’s Who’s Afraid of Virginia Woolf :o( and they didn’t seem concerned that two other people were captive to their bickering – what a pair! Luckily, we split several times for exploring. On the way from Dubrovnik to Mostar and back we crossed a total of 12 borders. Thankfully the crossings were quick and painless and didn’t require stamping 12 separate passport pages! The borders are a “legacy of the wars that tore Yugoslavia apart two decades ago”. You pass a six-mile stretch of Bosnia-Herzegovina near the resort town of Neum. Then the road circles back to Croatia through the Neretva Valley before you enter Bosnia again. In the past, the road was all in one country without borders. 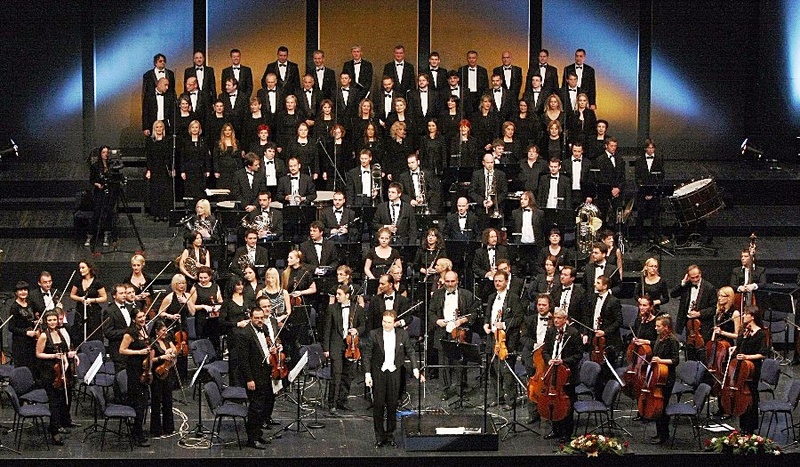 Croatia and Bosnia signed the “Neum Agreement” in 1998 guaranteeing free passage from Croatia’s northern Port of Ploče through Bosnia-Herzegovina. Neum is close to Dubrovnik International Airport. Non-EU/EFTA citizens passing through Neum who plan to stay in Bosnia a while need Croatian exit and Bosnian entry stamps in their passports. Not obtaining them is “illegal and causes issues when exiting”. We departed via Dubrovnik Bridge heading north along the coast passing Daksa Island. The island was the “site of a brutal massacre in 1944 by Yugoslav partisans“. The Yugoslavs arrested hundreds of Dubrovnik citizens from the Independent State of Croatia (Nezavisna Drzava Hrvatska – NDH). They accused some of being Nazi sympathizers and executed them without a trial. Today Daksa Island is abandoned. 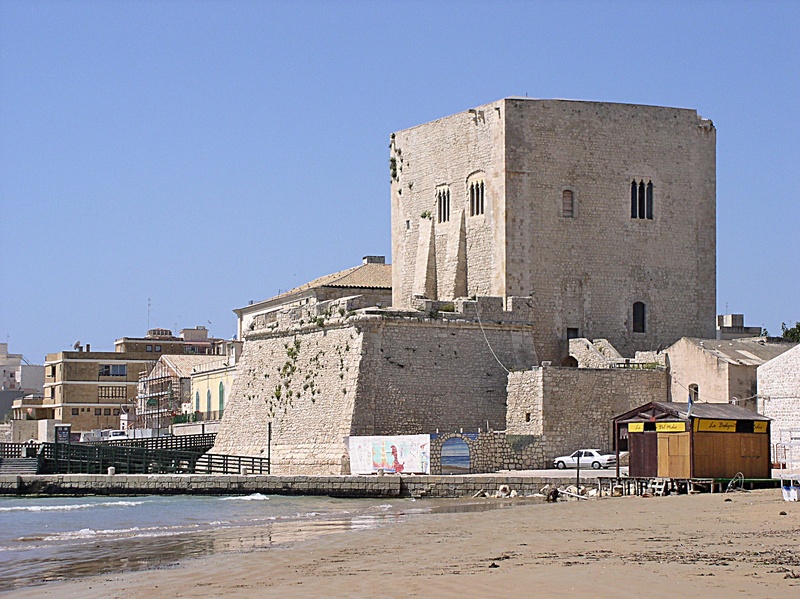 Locals claim the “ghosts of those executed” haunt the island. 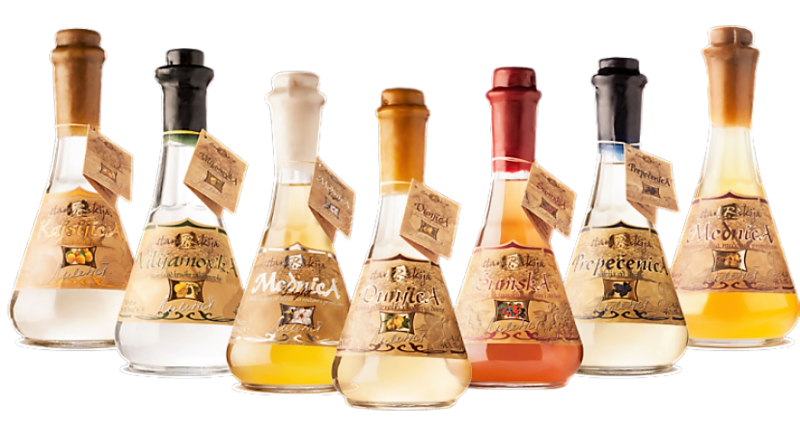 With minimal research, it seems the NDH era is its own chapter in Croatian history. 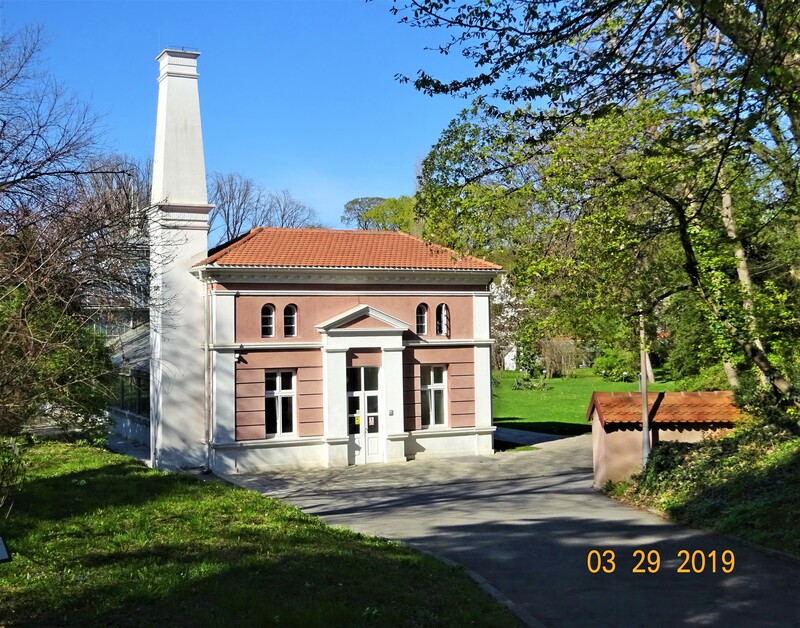 We passed Arboretum Trsteno in the small Croatian village of the same name. The beautiful gardens have an interesting story. Dubrovnik’s Gozze family started them in the 15th century by “asking the city’s sailing community to bring back seeds and plants from their travels around the globe”. 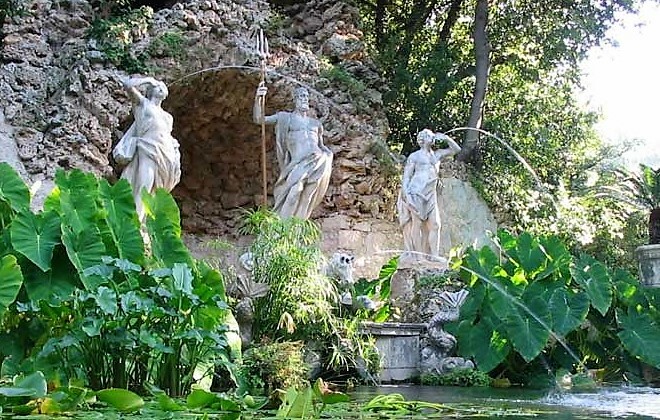 The gardens include an aqueduct and 18th century fountain with a statue of Neptune and two nymphs. 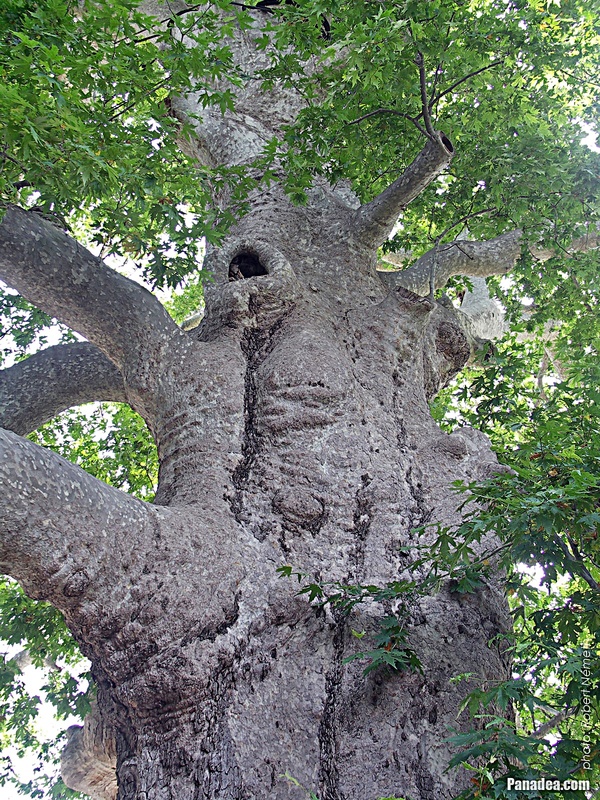 The arboretum is home to some of the oldest trees in Croatia. 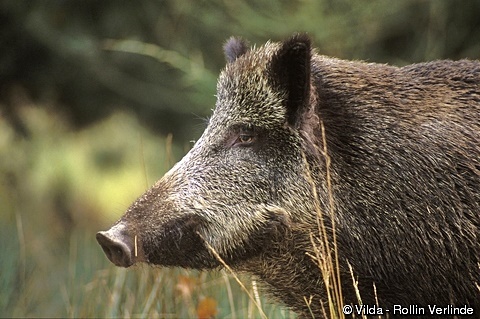 Wild boars inhabit the low, bushy terrain around the Croatian villages of Zaton, Slano, Zavala, and Ston. Boar hunting is popular and locals consider the meat a delicacy. Slano and Ston are famous for their salt pans and valuable salt sea factories along the Duboka River. The Duboka is a tributary of Bosnia’s Vrbanja River running near Međugorje Mountain and Bojići Village. 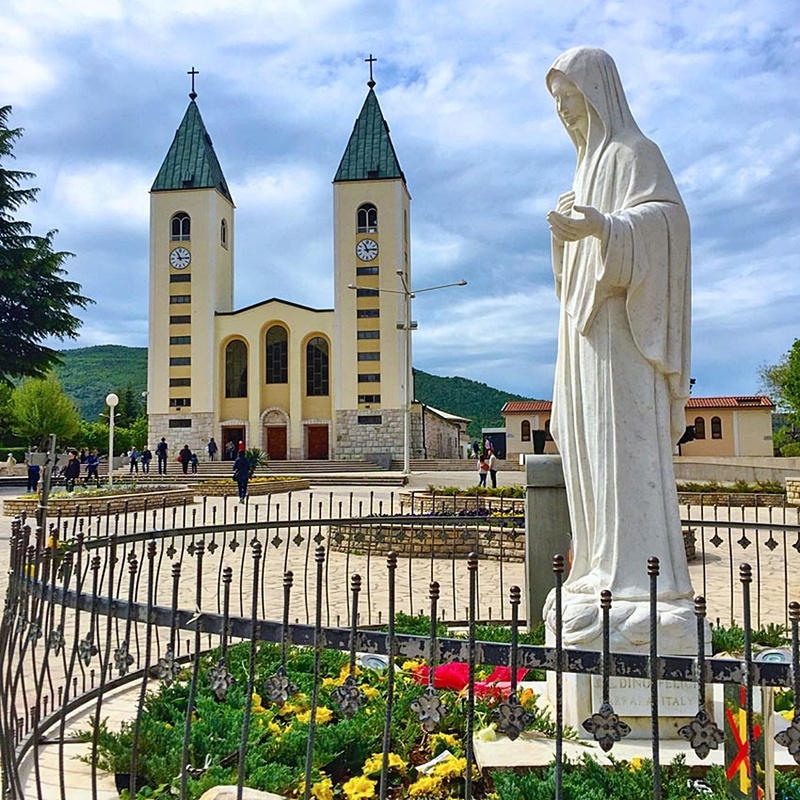 As we turned northeast and headed inland through Bosnia, Neum was our first stop. We sat inside enjoying coffee and escaping another torrential downpour. On the way to Počitelj, we passed more villages along the blue-greenish Neretva River. 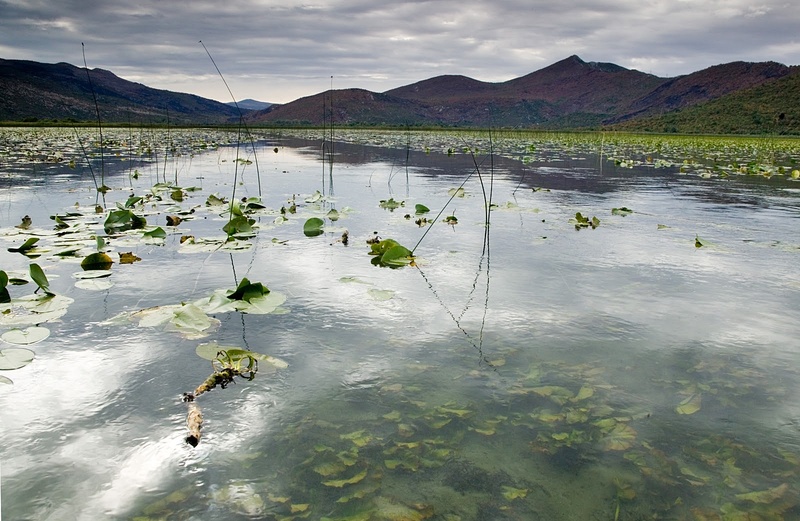 Hutovo Blato Nature Park is in the Neretva Valley near Capljina. 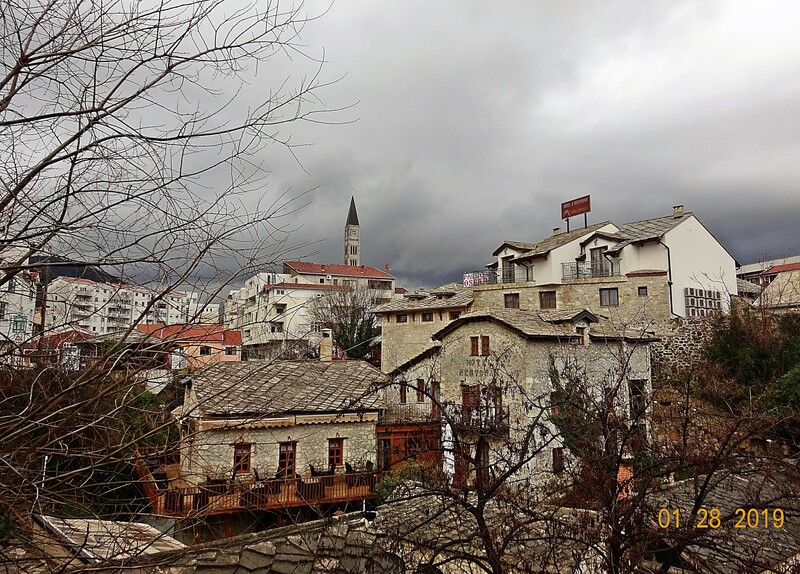 Capljina has interesting archaeology and “untouched wilderness”. It’s a “unique Mediterranean swamp and wintering place for birds in Europe”. 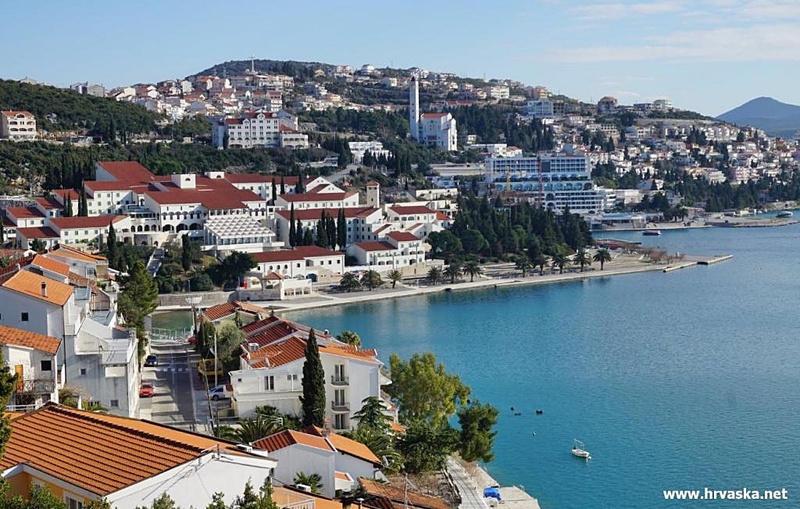 Neum is the only seaside resort in Bosnia but the population is primarily Croatian. 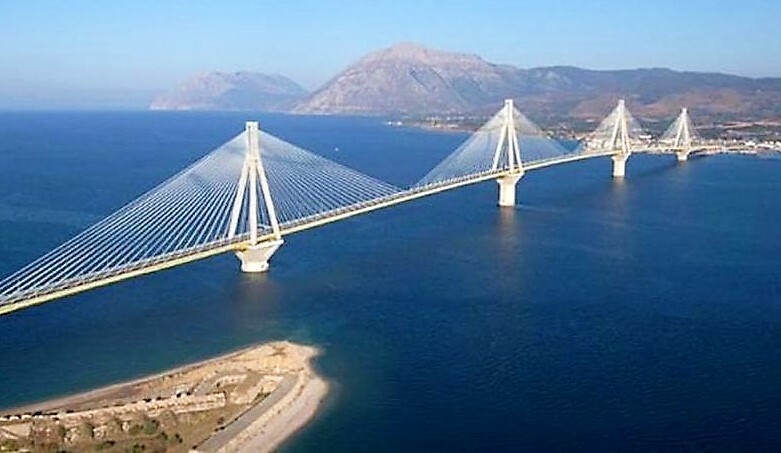 Motor traffic between the northern Croatian town of Ploče and southern Dubrovnik passes through the “Neum Corridor”. At the border, there are two lines – “one for travelers into Bosnia and another for those in transit to other parts of Croatia. At this border sometimes they check passports, sometimes not. Ours weren’t checked. 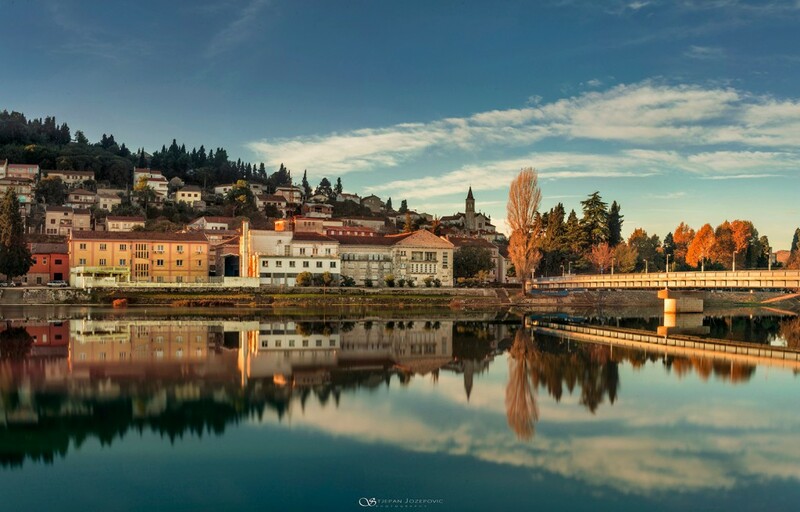 Built on a hillside near the banks of the Neretva River, Počitelj (stone town) has the longest operating international art colony in southeast Europe. 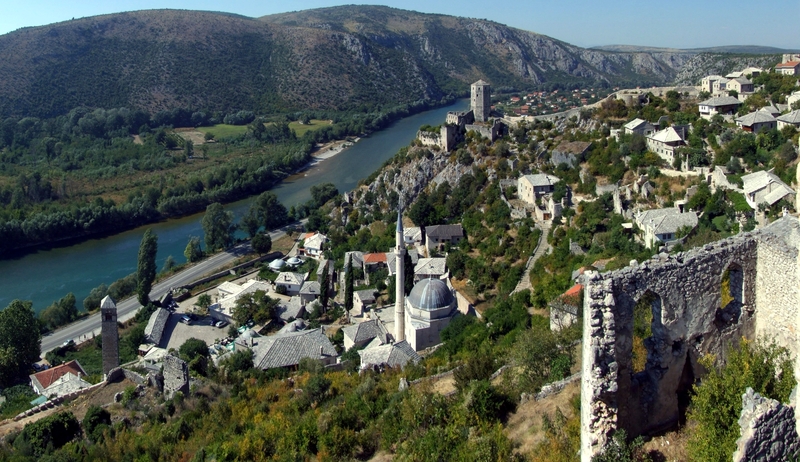 The remains of Počitelj’s medieval wall surround 15th century Turkish houses, mosques, and a tower and citadel. 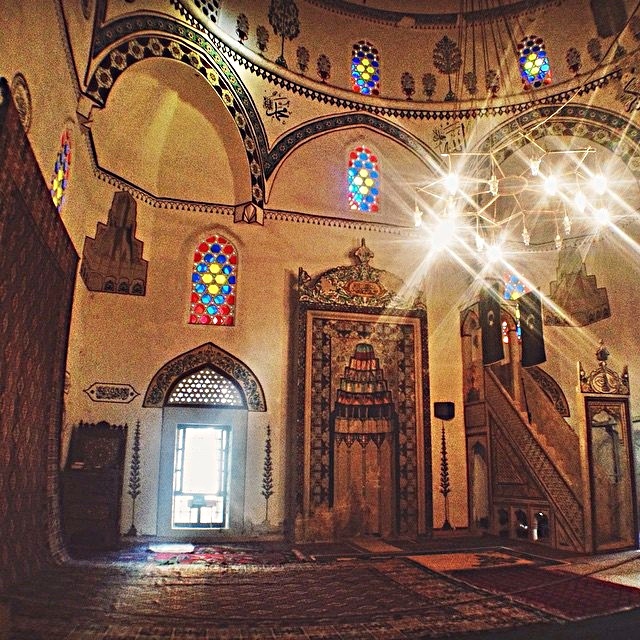 Architecture reflects a strong Ottoman influence. Počitelj “fell into neglect in 1878” when Bosnia-Herzegovina was taken over by Austro-Hungarian rule. 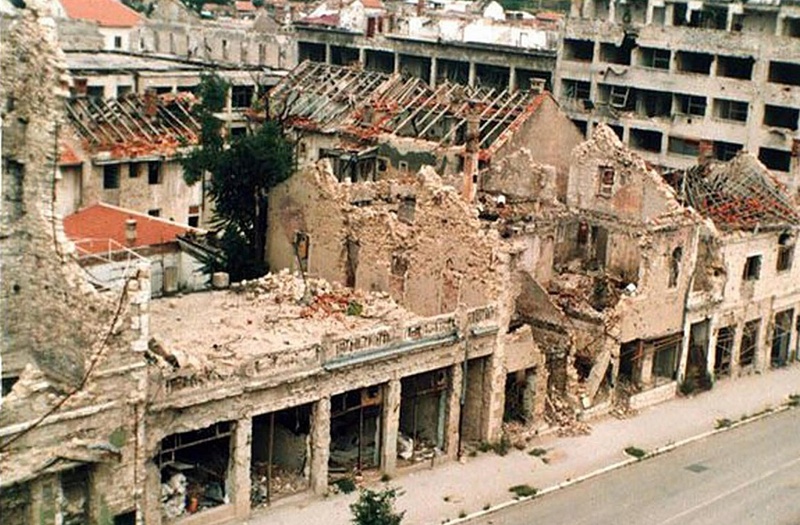 In 1992 during the Bosnian War Počitelj was bombed and most of its population displaced. 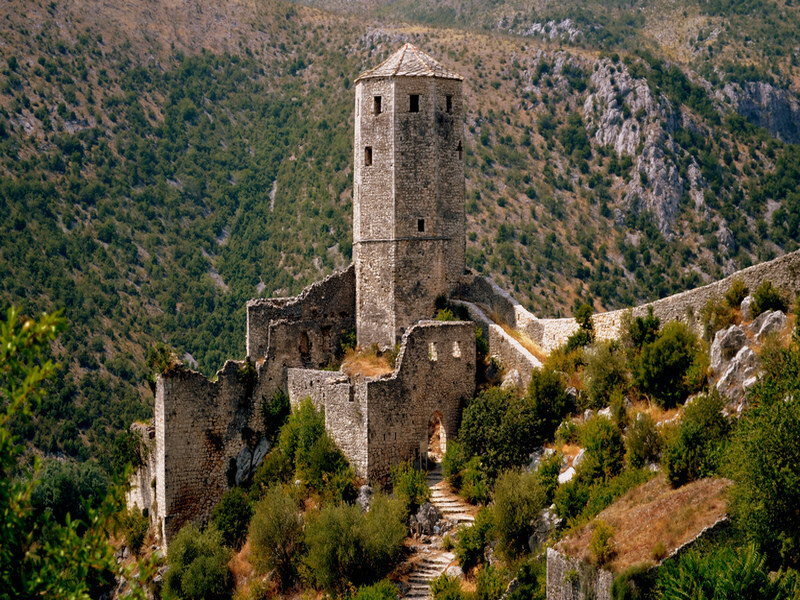 In 1996, World Monuments Watch added Počitelj to a list of the world’s 100 most endangered cultural heritage sites. 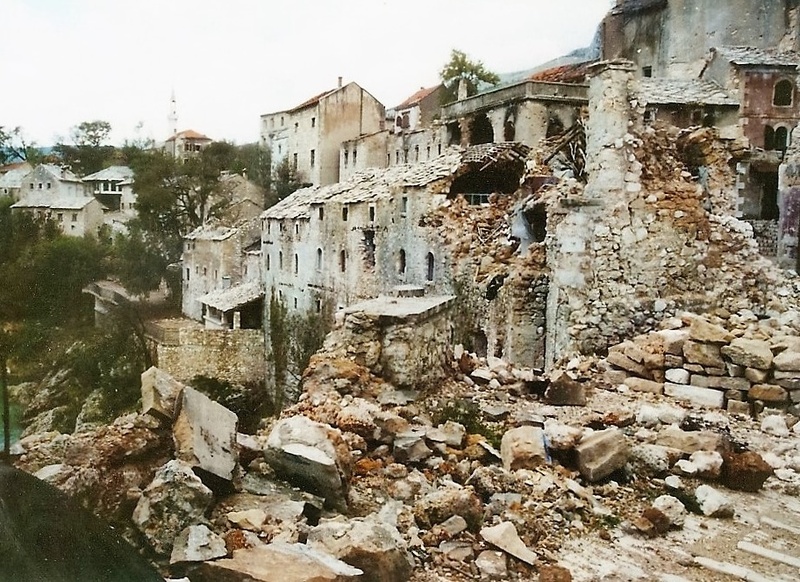 In 2000, the government started reconstruction encouraging Počitelj refugees to return home. 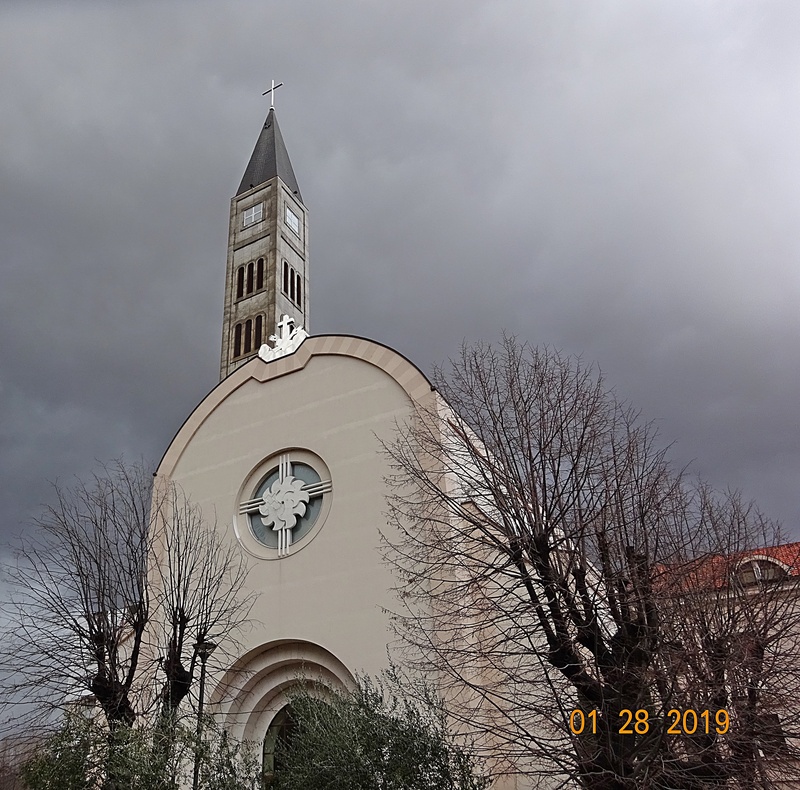 Continuing through Metković and Opuzen on the way to Medjugorje, we stopped to visit the celebrated Catholic church. 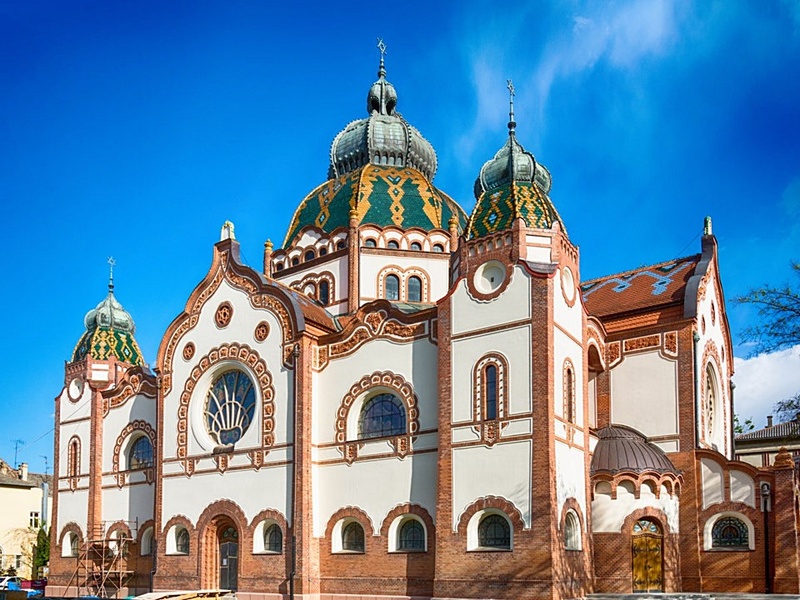 It’s a major spiritual site and one of the “most famous pilgrimage destinations in the Catholic world”. 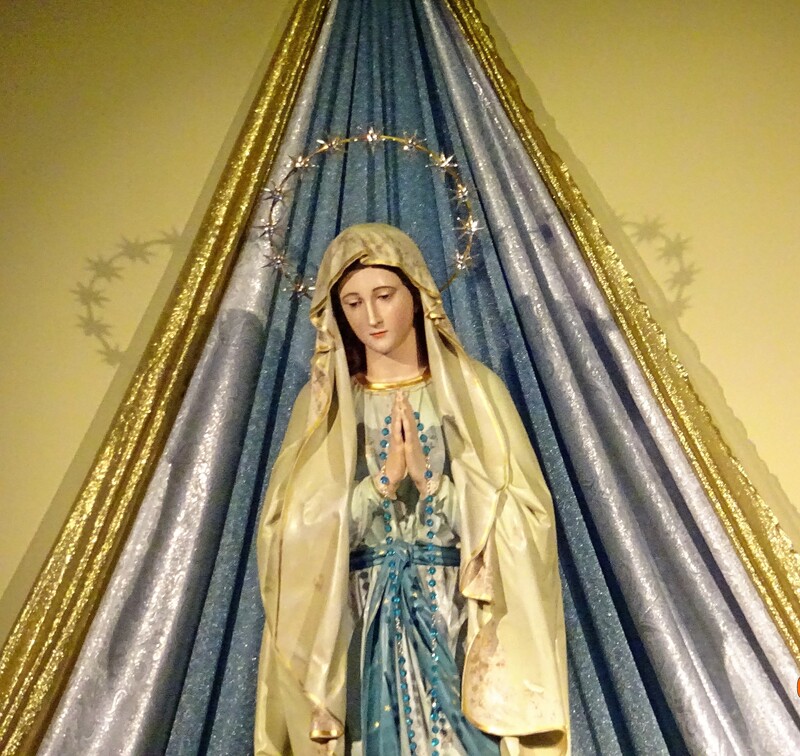 Since the Our Lady of Peace Apparition occurred in 1981 it’s visited by pilgrims and tourists from all over the world. I sat for a while inside the church with two other people who were praying. Relentless rain showed no sign of letting up and made exploring uncomfortable. It’s off-season, so except for a few tourist shops selling religious statues, most businesses were closed. 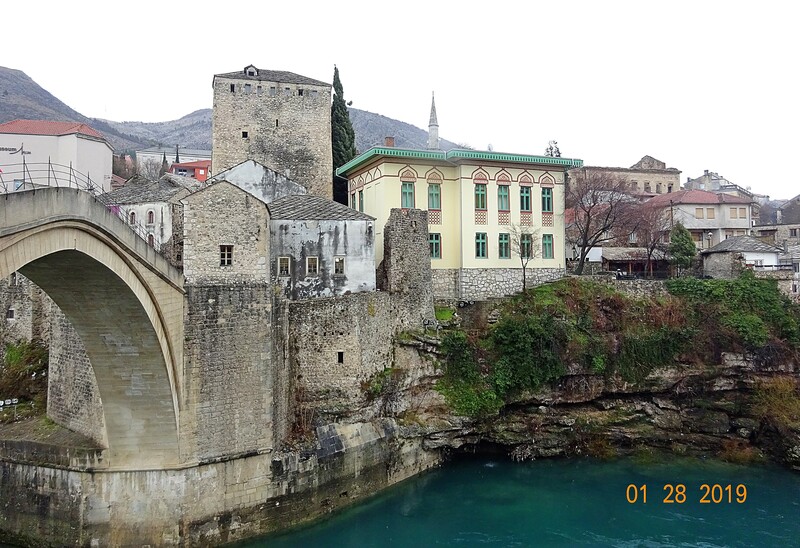 We continued to Mostar, the focal point of the tour, and spent three hours walking around the city. A local guide led us through Old Town in the rain. 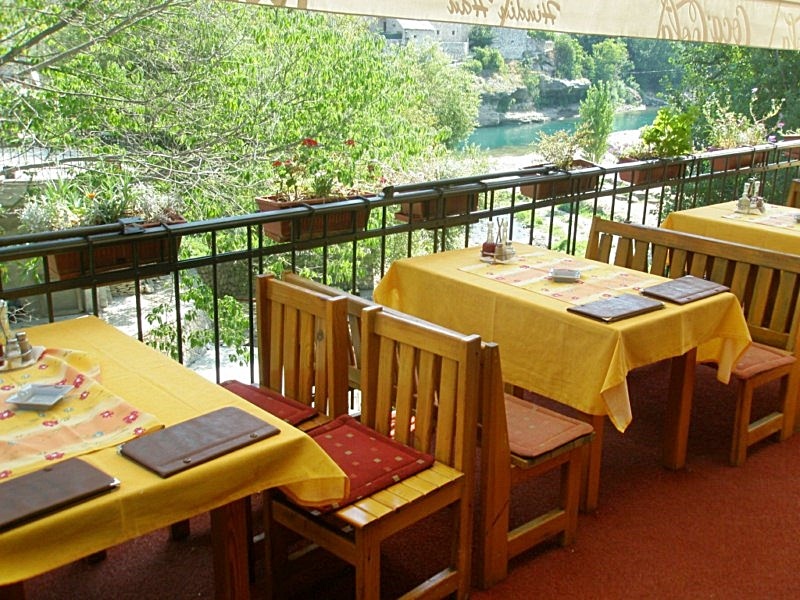 Afterwards I found a restaurant – Hindin Han – on the riverside with views of the Neretva River and enjoyed a Bosnian lunch with interesting locals.The restaurant building is a refurbished historical home, with wooden balconies and white-wash walls. 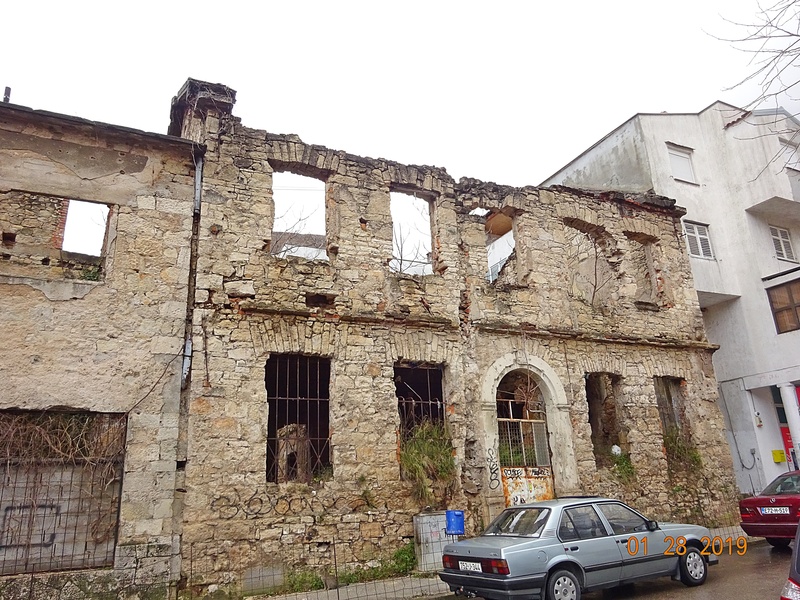 Mostar looks depressed and parts of the city are full of trash and rubble. During summer tourists bring needed income. Off season it almost seemed deserted. 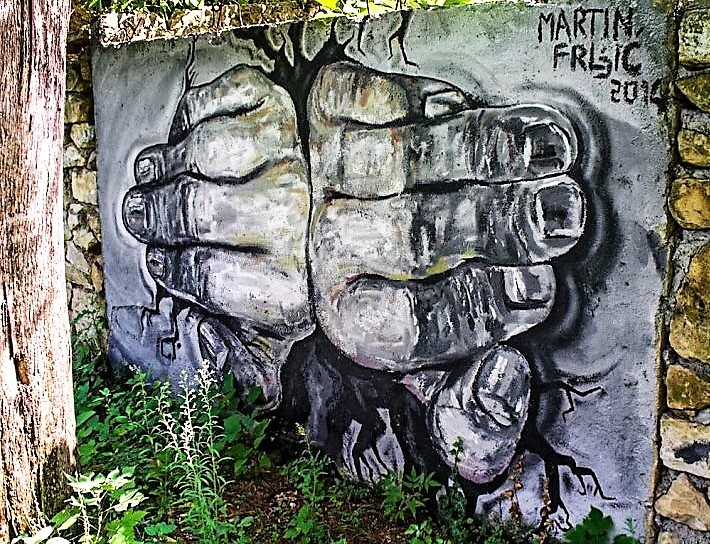 Mostar holds a Street Art Festival in spring, when artists from all over the world come to create new murals and works of art. 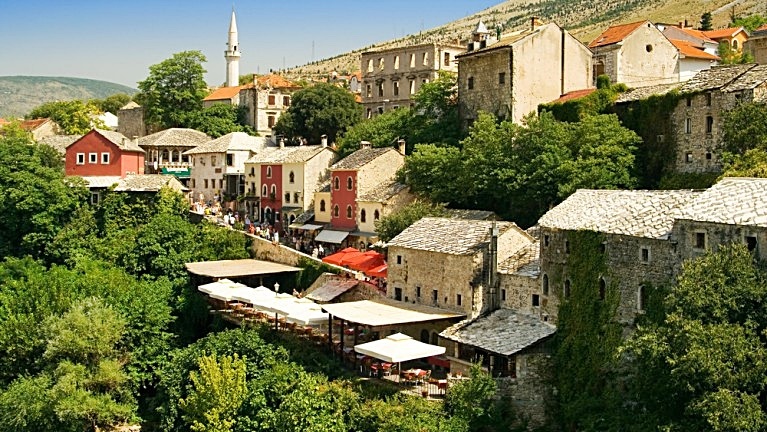 Through the centuries Mostar became the meeting point of various cultures and religions. The old city is divided by east and west. The east is mostly Muslim and the west Catholic. I detected some tension in the air even between our tour leader and the local Mostar guide who was clearly Muslim. Minarets in mosques on the east side sang out the Islamic Call to Prayer – something I hadn’t heard since a trip to Istanbul in 2017. 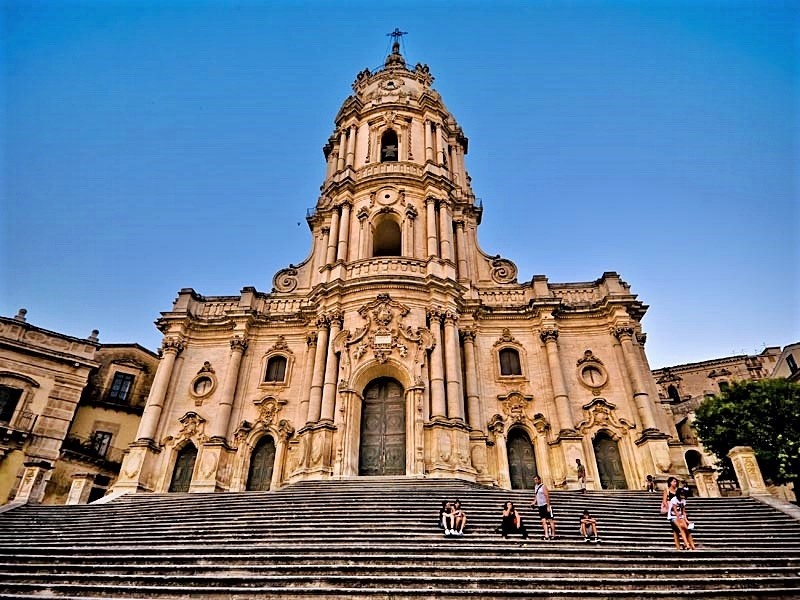 Church bells tolled in Catholic monasteries and cathedrals on the west side. Our Muslim guide told us that many Catholics converted to Islam after the Bosnian War. 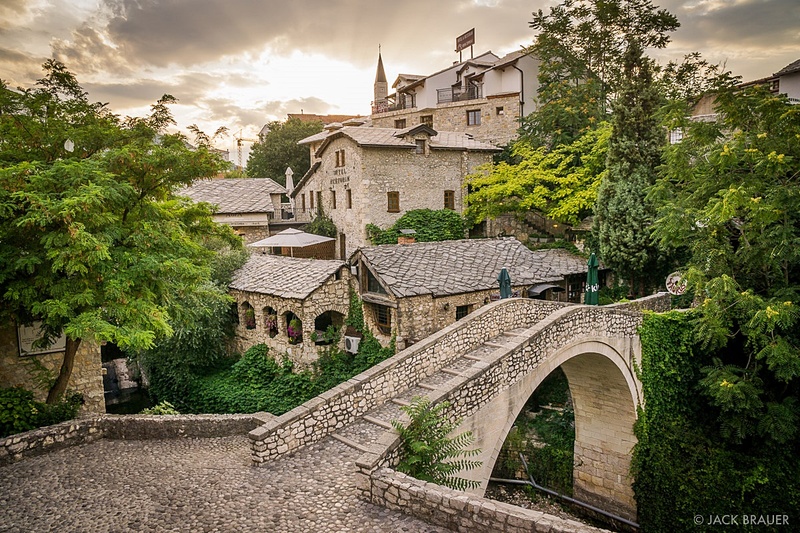 Mostar’s symbol is its beautiful Stari Most, a 16th century Ottoman-style bridge that connects east and west. The bridge has rich history and it’s been bombed and damaged many times. 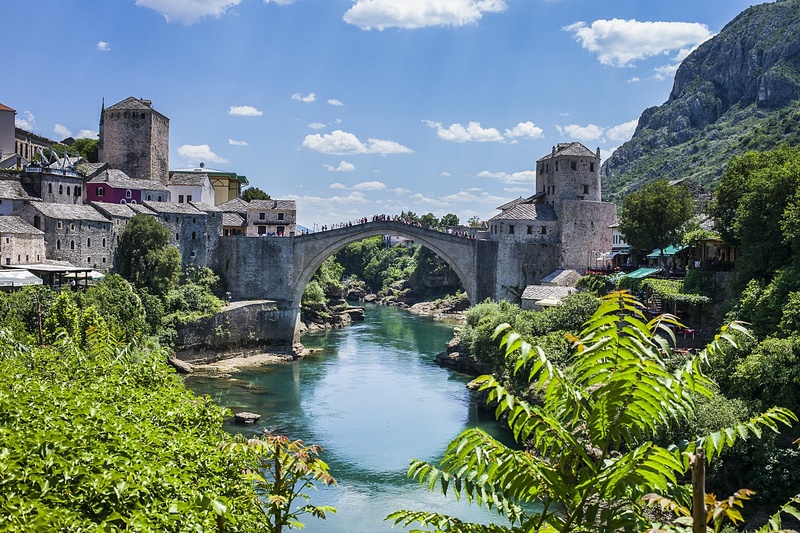 Stari Most stood for 427 years until it was destroyed completely in 1993 during the Bosnian War and then rebuilt in 2004. 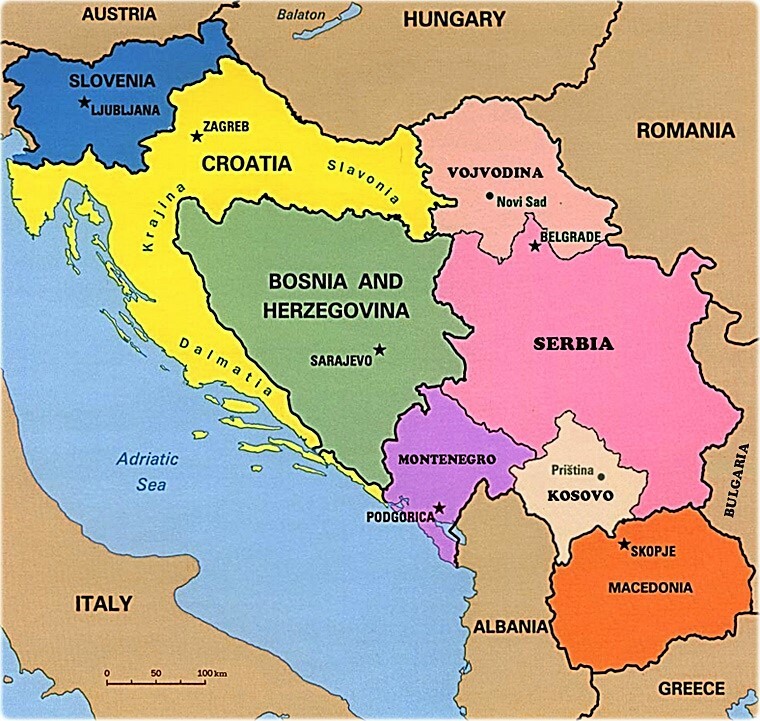 Bosnia and Herzegovina has three Presidents – Serbian, Croatian, and Bosnian. Locals dive off the Old Bridge plunging 20 metres (65 ft.) into the river. 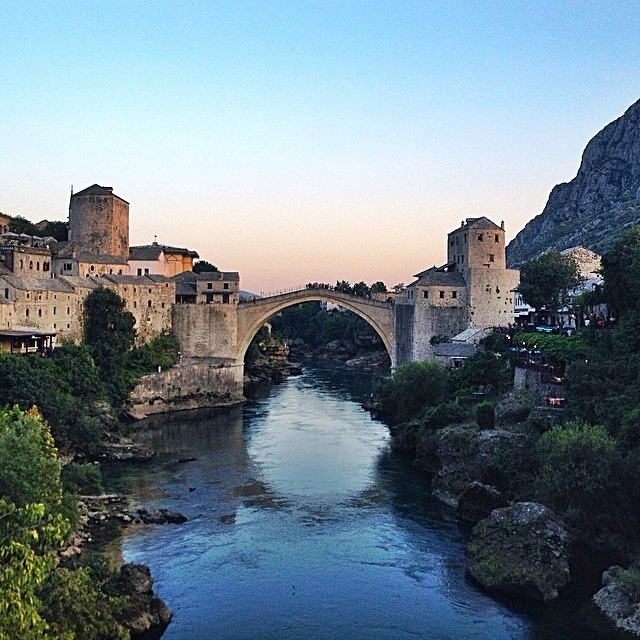 The “practice of Bridge diving started in 1664” and became a tradition for the young men of Mostar. In 1968, the city held a formal diving competition, which continues today. Old Bridge is breathtaking and the color of the Neretva River is such a vivid bluish-green it’s almost surreal. 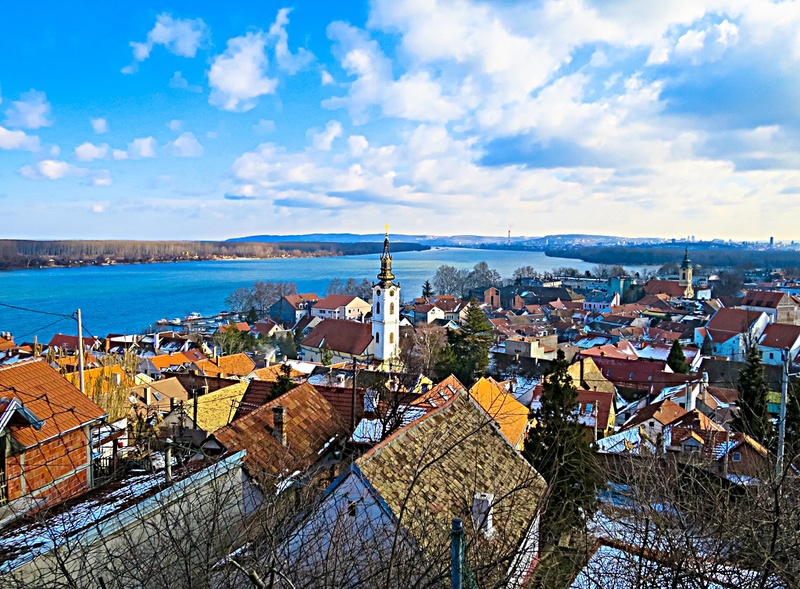 Slowly the city is becoming a popular destination with its varied architecture, art, forests, mountains, holy sites, waterfalls, bridges, and street art. I would love to do some hiking and explore the area further during better weather. 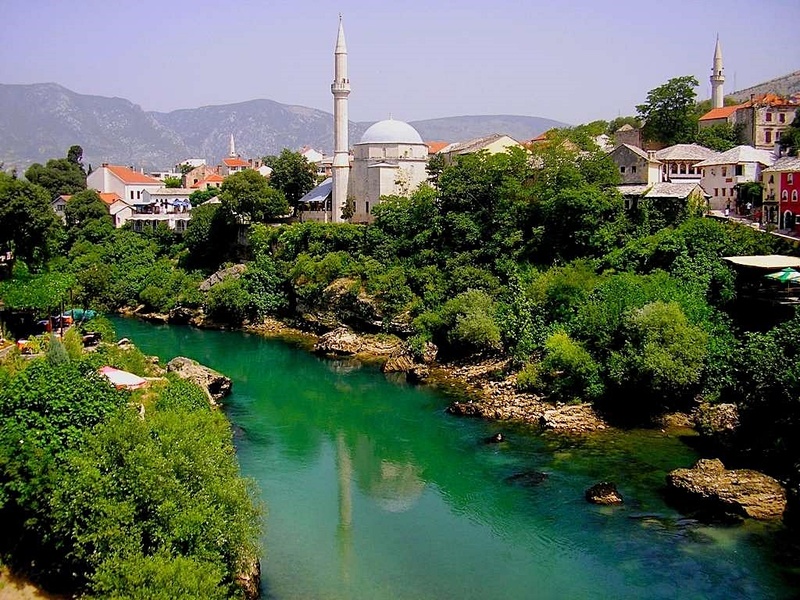 Koski Mehmed Pasha Mosque is another Mostar icon. You can climb the stairs following a narrow tower to the minaret where panoramic views are amazing! 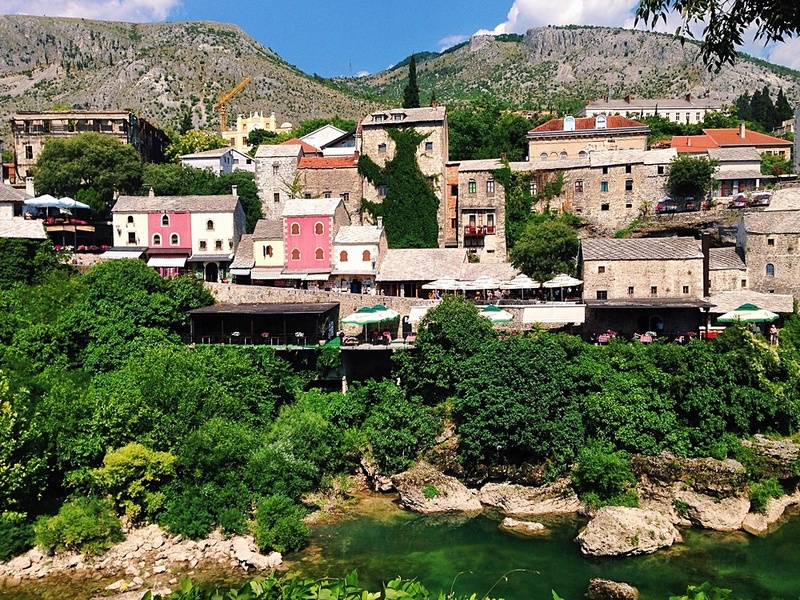 Like Istanbul, Mostar has small cafés serving Turkish tea and coffee. I had a piece of baklava – the best I’ve ever tasted! 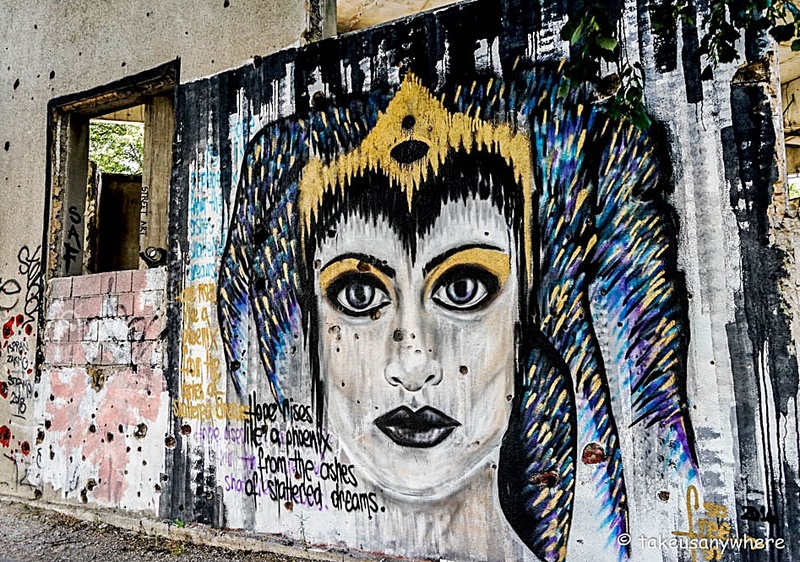 Mostar is known for its interesting street art and abandoned buildings, many riddled with bullet holes from the Bosnian War. 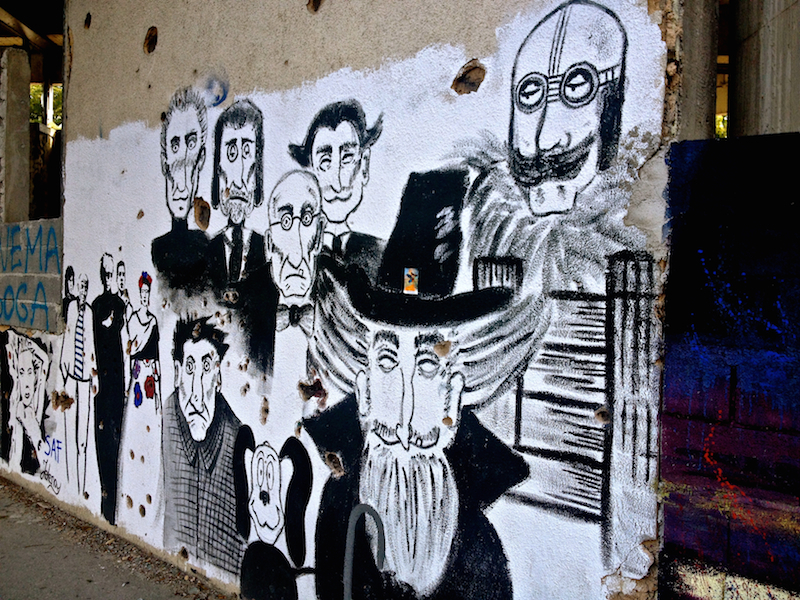 “Today, young artists use the buildings as canvases to protest oppression and express themselves creatively.” It reminded me of artists in Maputo Mozambique who make creative art using civil war remnants. 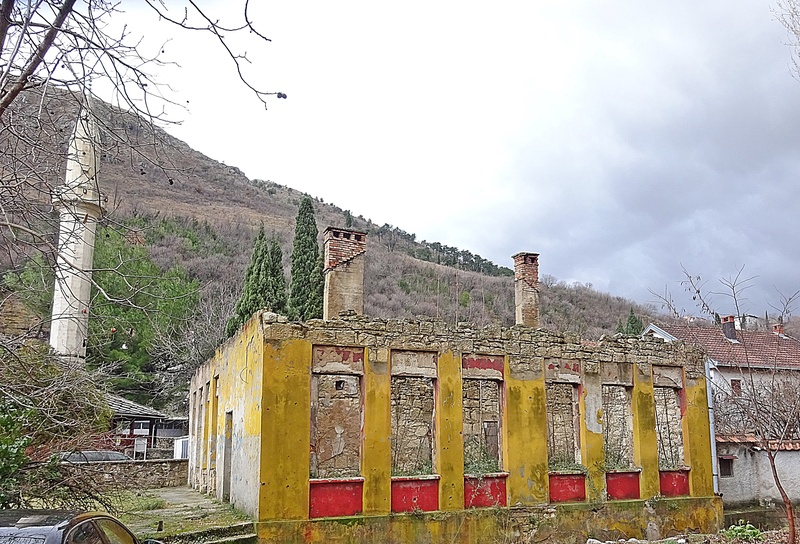 Some of the abandoned buildings include a sniper tower, Neretva Hotel, and an old airport hangar. At one time the sniper tower was a bank. It’s positioned along the city’s front border. 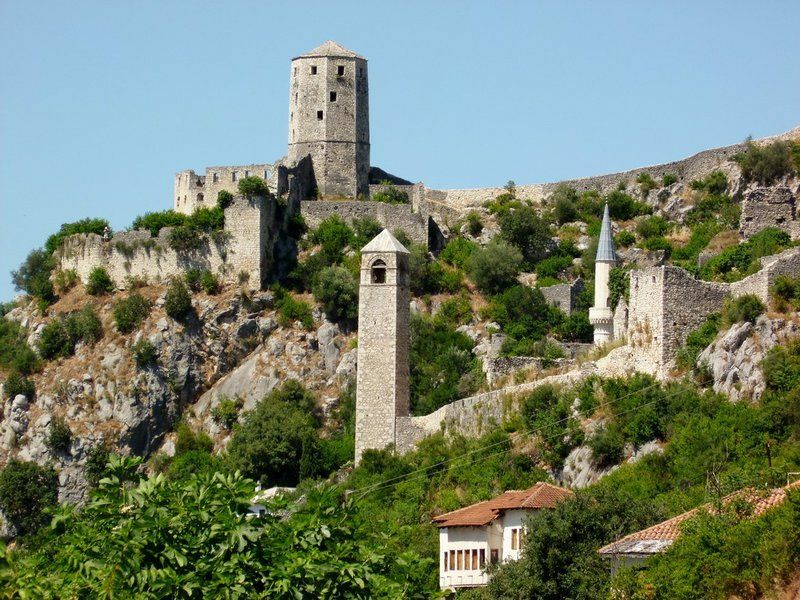 During the Bosnian War it became a “base for snipers who hid in the tower to take aim at targets”. 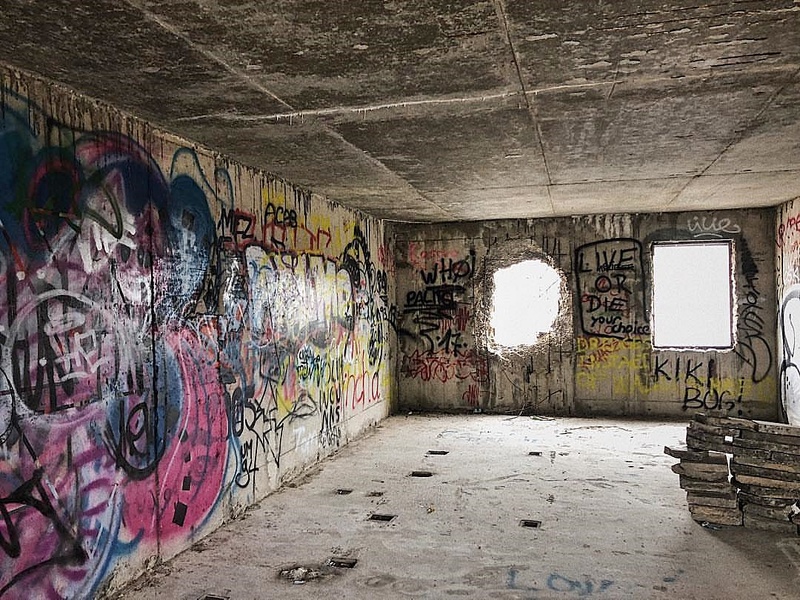 Today, the tower is decorated with street art and homeless people sleep there at night. 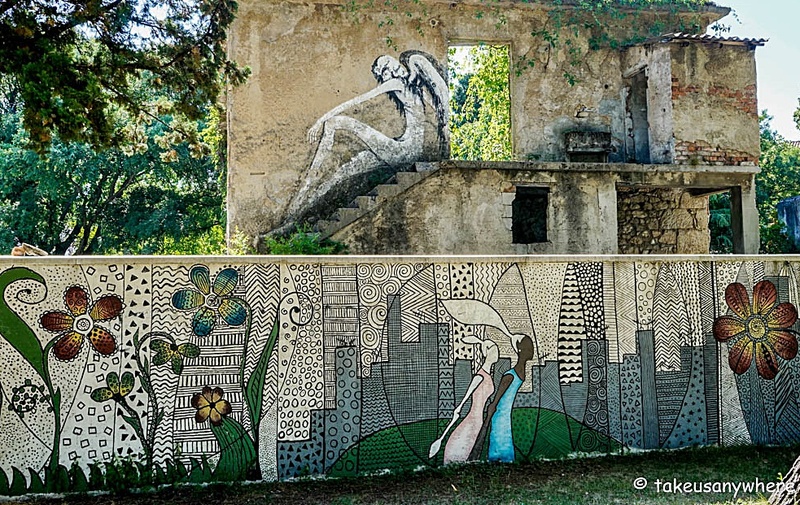 You can jump over the back wall (near the Nelson Mandela quote) to explore the street art and enjoy a great view of Mostar from the top. 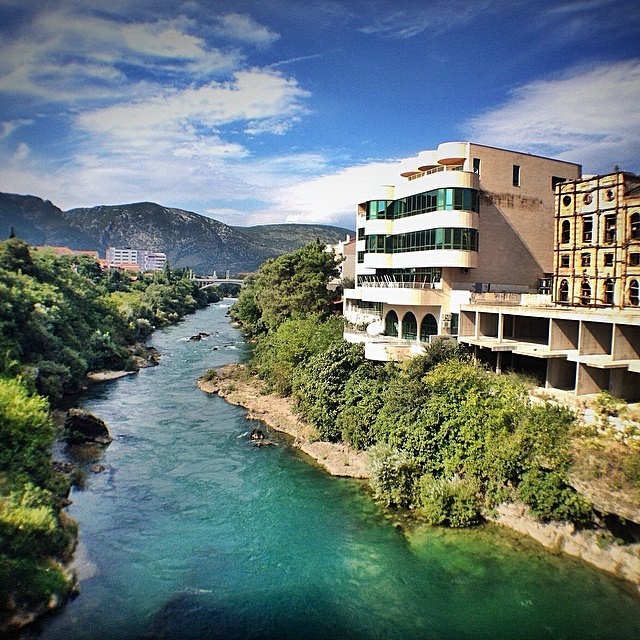 Hotel Neretva was a grand hotel nicknamed “Tito’s Palace” after Yugoslav communist revolutionary Josip Broz Tito. It’s now a ruin. 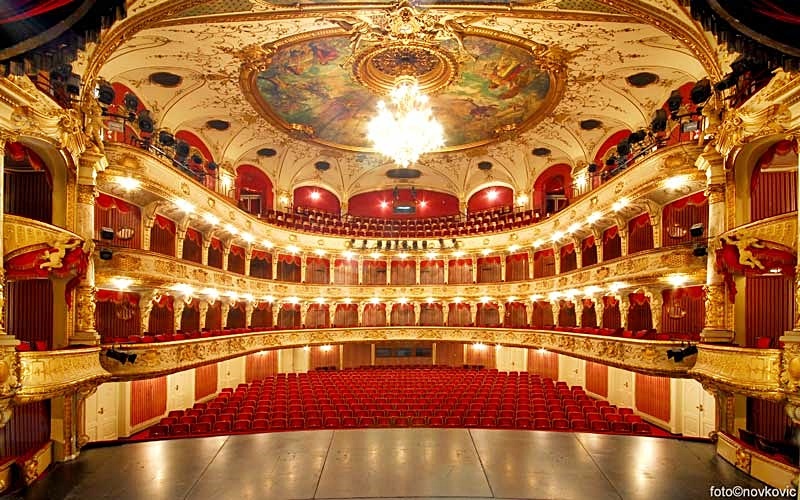 “After years of deadlock,” restoration continues at a cost of 9 million Euros. 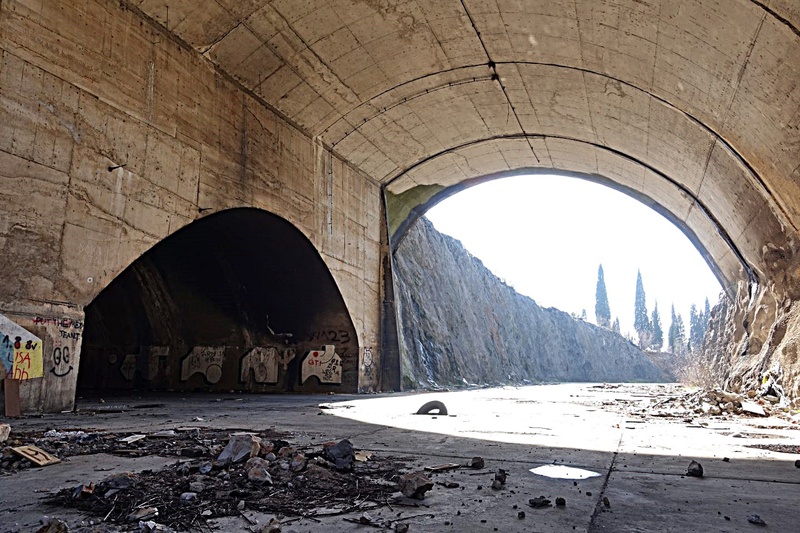 I didn’t see Mostar’s former top-secret underground airport hangar. It’s disguised in the mountains near the airport. Tito stationed fighter planes there to hide them from the Soviets. You can tour the hangar on your own or book a “Death of Yugoslavia Tour“. It wouldn’t have been much fun in the heavy rain. 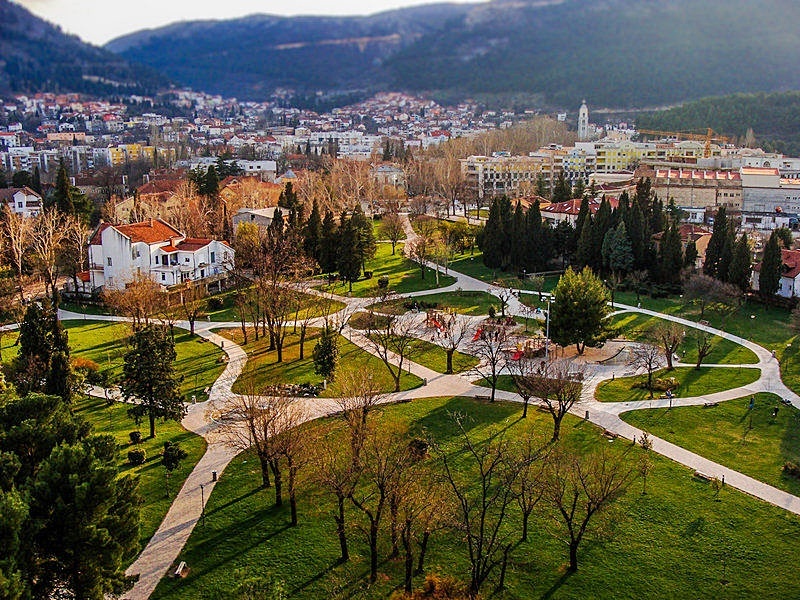 A “weird, offbeat” sculpting of Bruce Lee is in Zrinjevac Park. Croatian sculptor Ivan Fijolic created the statue in 2005. At the time it was in Spanish Square and the artist intended it to be a “fun, lighthearted symbol of peace”. Some locals took a dislike to the statue and vandalized it. Replaced in 2013, it’s still there. We didn’t visit Kravice Waterfalls outside Mostar – probably best on a hot summer day. People swim in the lake and under the waterfalls. 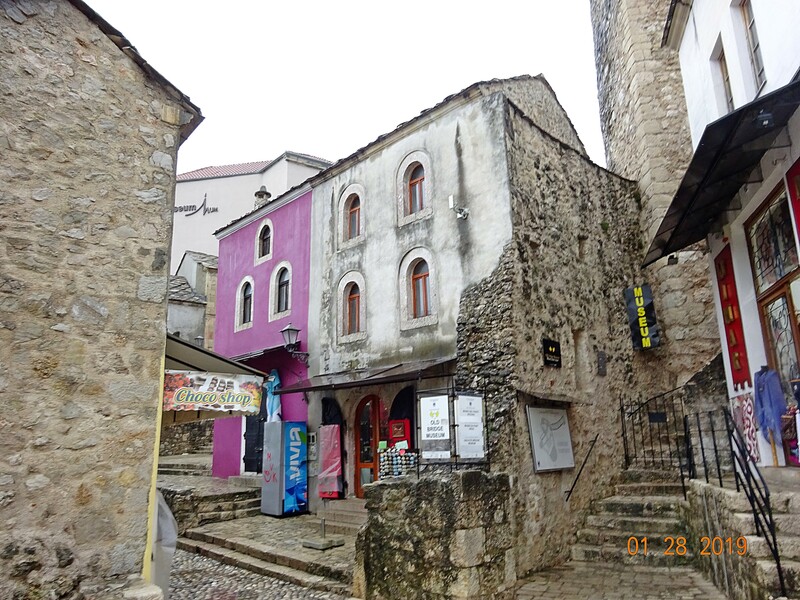 Blagaj Tekke is another interesting place near Mostar. 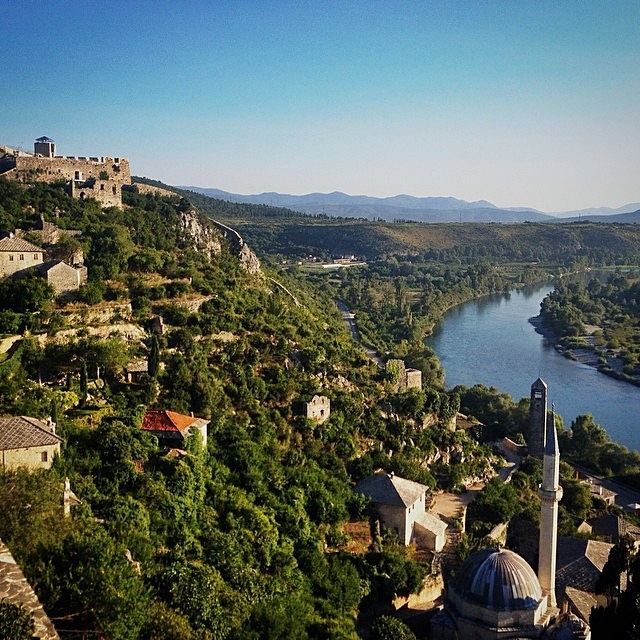 It’s “one of Bosnia’s most holy and ancient sites.” Built around 1520 it’s known as the Dervish Monastery and was built for Sufi gatherings. 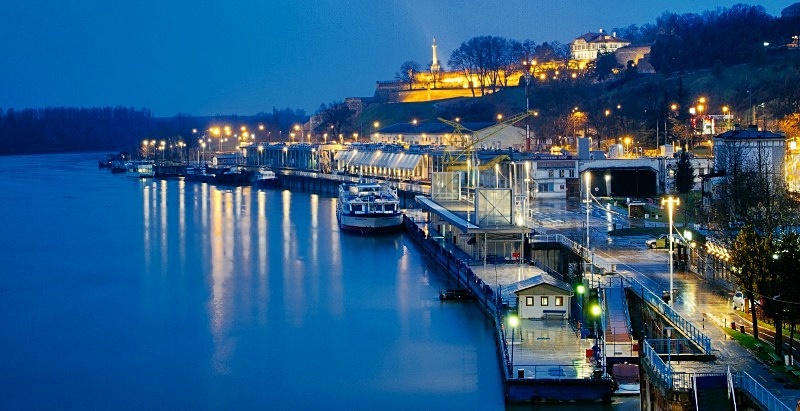 It “rests beside the fast-flowing blue-green Buna River, which spills out of a darkened cliff-cave”. 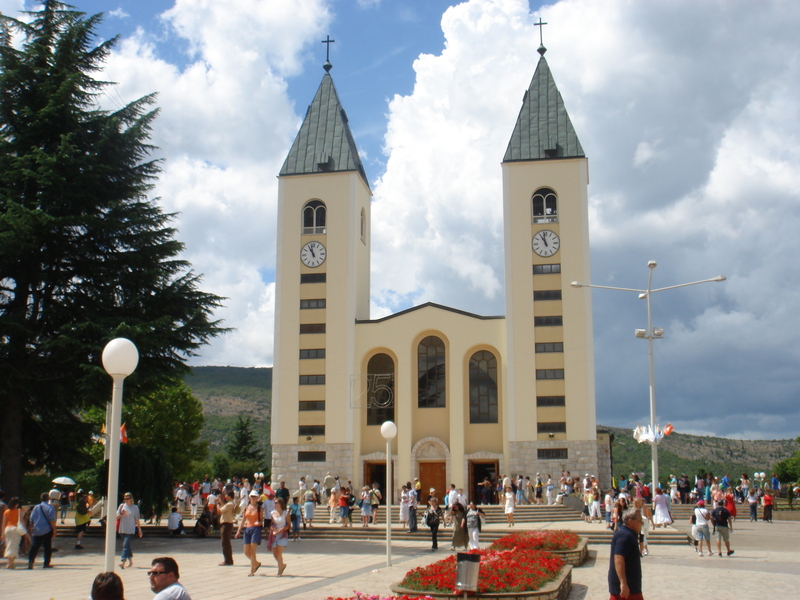 Miraculously, the Monastery wasn’t damaged during the Bosnian War. 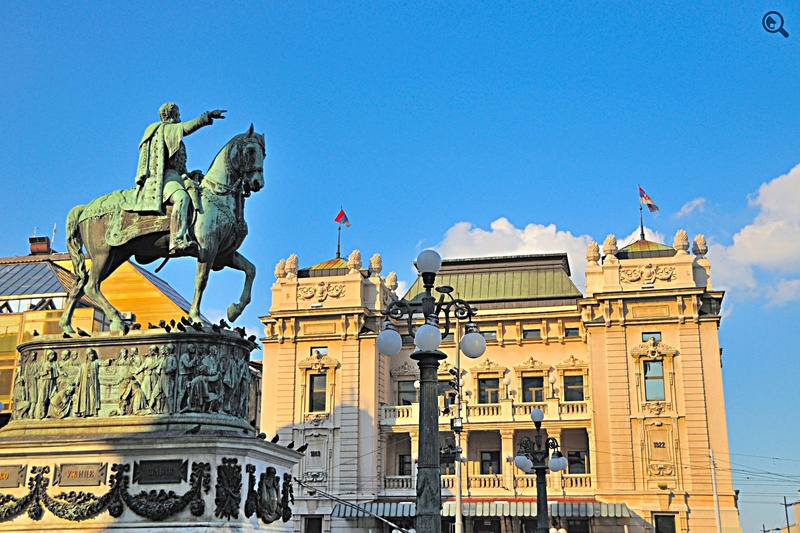 Bosnia has three presidents! Not sure why? All in all it turned out to be an amazing, educational day in Bosnia!